Best known for their iconic series of comic books first created in 1939, the Marvel company has undergone a series of transformations and changes over many years. The company finally evolved into Marvel Entertainment, a name given to it by The Walt Disney Company when they acquired it 2009. 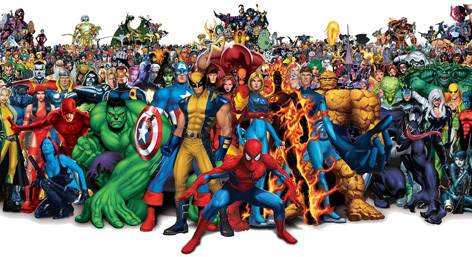 Their super hero characters are well known to billions of fans worldwide, and the incredible popularity of these films has led to many licences being issued for thousands of different products; with Marvel toys right there at the top of the pile. Each new film featuring one or more of these characters from the Marvel Universe always seems to break the latest box office record. With an almost endless list of characters to work from, toy companies have created the most fantastic ranges of Marvel action figures, construction sets, masks and playing cards. Also in the line up are lunch boxes, games, jigsaws and even licensed wheeled toys like Fantastic Four scooters or Green Goblin bikes. Captain America, Spider Man, the X-Men, Thor and Iron Man are just a few more of the incredible properties that have made the transition from movies to Marvel Toys. Kids like nothing more than holding a birthday party with a Marvel character theme, and a broad choice of party products makes sure these are always a hit. Add that successful recipe to Marvel character dressing up outfits, and kids can role play each of their favourite characters whilst tucking into sandwiches and cream cakes!